(Bloomberg) -- European equities advanced and mining shares led the gains on optimism the U.S. and China will come to a trade agreement. The Stoxx Europe 600 Index added 0.4 percent. Arcelormittal rose 2 percent. The Financial Times reported that while the U.S. and China are still at odds on implementation and enforcement of a deal, most other roadblocks have been cleared. Lloyds Banking Group Plc climbed 2.3 percent and Banco Santander SA added 1.8 percent after the Spanish lender said will target progressive cost savings of 1.2 billion euros ($1.35 billion) a year and will invest more than 20 billion euros in technology. 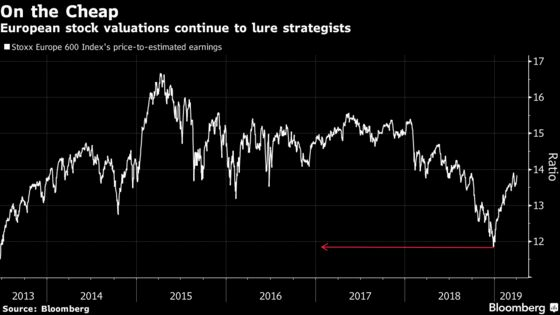 European equities are enjoying a strong start to the year, posting the best quarterly gain since 2015, but analysts and investors worry that further upside is limited. Europe and the U.K. are the least liked equity regions globally, according to Bank of America’s fund manager survey, and outflows from European stock funds have been continuing almost non-stop for over a year. “Many negatives are likely priced-in and potential positives should not be ignored,” said Barclays strategists, including Emmanuel Cau, in a note today. “The fundamental backdrop for European equities is not exciting, but valuations likely reflect a lot of negativity already."